In this post, we will show you how to setup Event Tracking with Google Analytics for your website. You will be able to track how certain elements of your website are interacted with (i.e. how many times a button or link was clicked) that is not part of standard reporting by Google Analytics. Capturing this data will allow you to better understand how visitors interact with your website and if they are performing the actions you want them to during their visit. You must have an active Google Analytics account and the correct tracking code added to your website. 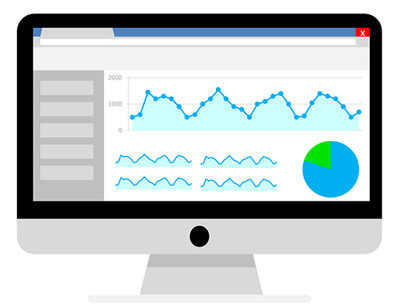 This allows the data to be sent from your website to Google Analytics. Before you start, it’s important to understand the different data components that will be passed to Google Analytics when an event happens. These are category, action, label, and value. Before implementation, you will need to define a structure on how your events are going to be setup and what names you will be using for category, action, label (optional but helpful) and value (optional as well) for each element. Depending on the type of Google Analytics tracking, your code implementation will vary. View the source code of your website and inspect your tracking code to see what version you have installed. It will be one of the types listed below. We will show examples for each type of Google Analytics tracking code. You will then find the existing code of the button or link you want to track and add additional event tracking code to it. Then upload the changes to your web server. The code below corresponds to the example used above with a downloadable PDF link. The bold and italicize part of the code corresponds to the event tracking and the red words correspond to the structure and names which were previously defined. In order to test that event tracking is setup properly, you will need to login to your Google Analytics account. Make sure you applied the correct format for your Google Analytics tracking type. If not, it won’t work. 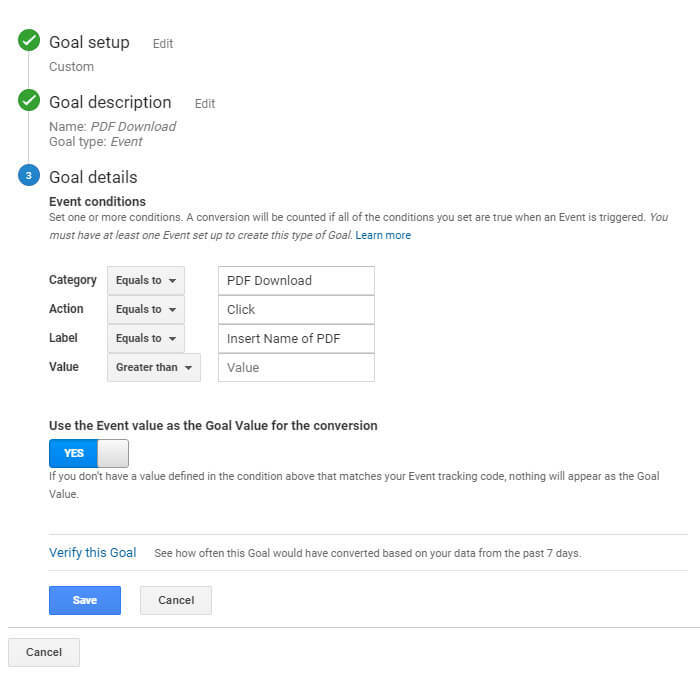 If you want certain interactions to count towards a conversion in Google Analytics, you can setup a goal that corresponds to the fired event. If you would like to track all events within a certain Category then only fill out that field. For example, if you wanted to track every PDF download. If you wanted to track only certain events then make sure to fill out all fields that correspond. For example, only a PDF download for a certain whitepaper. We hope this blog post has been informative for webmasters and that want to better track visitor interactions with their website. If you need any assistance setting up event tracking on your website, we are here to help. Please feel free to contact us.